This week they solemly removed the last debris from the site of unspeakable terror and loss. In the end there was created at that site a beautiful silence that spoke so loudly, finally an oasis amid the cries for war, revenge, anguish, grief. An ironic calm to a disaster that began with so much noise, chaos, dust, and insane murder. The absolute and silent ending of the deafening attack and collapse of the twin towers symbolized, for me, an architect, the 'duality' the WTC always represented. 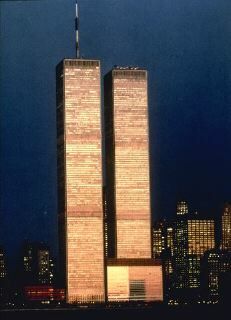 Also, as a fraternal twin myself (the towers were not identical, one was 6 feet taller than the other) I reacted to their destruction very personally, having lost my twin sister Patricia almost 20 years ago when she was in her mid-thirties. A twin-less twin, now I experience NYC twin-towerless, adding to the grief that I must accept, with great difficulty. It's been over a year, and I still cannot believe that those buildings are gone. I was just wandering around downtown, and I still look for them anytime I go outside. Those buildings were one of the little prizes you got when you lived in New York. Those buildings should not have come down. The terrorists themselves did not intend or even imagine that they would destroy the buildings. I just hope that something worthy will eventually rise on the site - I'd love to see at least one living, working skyscraper rise soaring - tall, strong, proud, and breathtakingly beautiful - this would be as harmonious a commemoration of the hopes and dreams of all those who died as the memorial itself. The courage of all those who ran back into the infernos to save others should be remembered as long as we still write history...--Liz L.